The opening general session is taking place here at the Alltech Symposium. 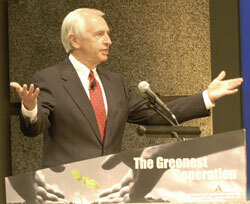 Attendees were greeted by Kentucky Governor, Steve Beshear. I think we’ve got about 1,700 people from all over the world participating in “The Greenest Generation.” I conducted some interviews with several of them from different countries which I’m in the process of editing and uploading and will have those later on.